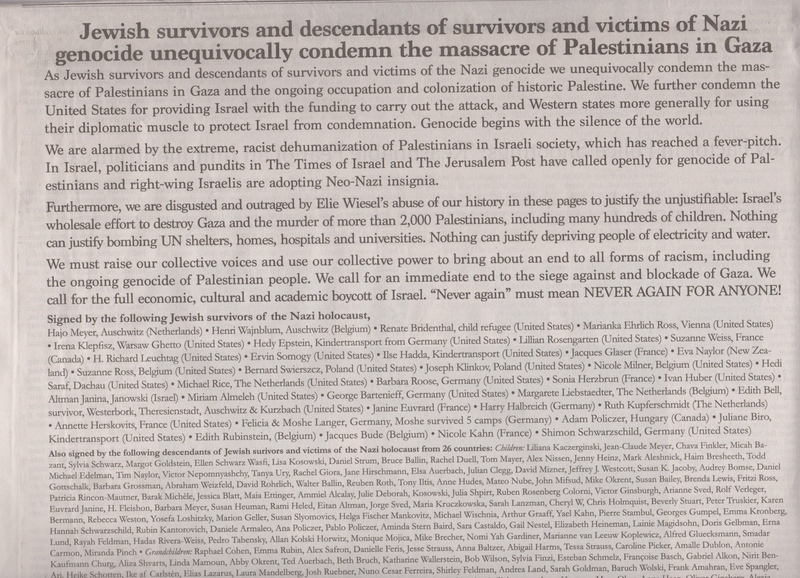 August 23, 2014 The New York Times printed an ad in the newspaper from Over 300 Survivors and Descendants of Survivors and Victims of the Nazi Genocide [which] Condemn[s] Israel's Assault on Gaza. The New York Times appears to have suppressed the ad to the internet. And it would be news to any other major newspaper. An article appears in Haaretz and in the London Guardian. So click the above text on Haaretz, an Israeli Journal, and here it is in the BBC World News. Thanks to all the Holocaust Survivors who were able and willing to speak out. What if much of what you thought you knew about Israel isn't true and was quite the opposite? How is peace possible if we do not know what our 30 Billion in tax dollars are doing in Israel? This is what a small united group of citizens of different backgrounds found out. What we uncovered over months shocked and surprised us. Everything was quite the reverse of what we expected and what is reported by the media. what is called the worst Apartheid in the World in Israel. and what took us months to learn. 1) There is absolutely no need on the part of Israel to negotiate at all because, in effect, they have taken just about every piece of land, water or gas reserve of any value in the region once called Palestine (even if it is obvious to everyone that it was the Palestinians'). Why should Israel, a nation founded on someone else's land, negotiate? The only thing that would bring them to this consciousness is guilt, witnessing this selfishness of taking everything, or of kindness or caring for their brothers which the Palestinian people truly are---their very brothers. While there are activists in the state of Israel aware of this, conscious of the reality of this situation and of the Apartheid their country instigates every day on the Palestinians, they are going to need a lot more help from the world, from us. 2) The Two State Solution: A farce. You think this means what it does not. Israel has no present intention to give back any resources. In the two state solution, in the the plans discussed at the nitty gritty, the idea is for Israel to continue controlling all the resources in the region and most of the land, making the two state solution a complete farce. 3) It's going to take the pressure of nations with a conscience, International World Pressure to resolve this issue and that includes pressure from the United States. The strongest leverage we people of the world have is 1) Economic sanctions and 2) Military Aid. As a country it seems the most important way we could support the resolution of this conflict is to withdraw aid from Israel because we are supporting the worst Apartheid in the world there on the Palestinian people. Yes, our weapons are doing just that. If you were under Apartheid in this century, wouldn't you too work toward the end of that? Yes, believe me you would. Our nation's founders were just under a king with the main complaint of unfair taxes and they overthrew England. So, yes, believe me you would. May the conscious people in power in nations bring this to an end, this continuous 24 hour cycle of Apartheid violence on the Palestinians, followed by cries of the Israelis that the Palestinians are hurting us, right after Israel bombs Gaza with untold fire power with our US Weapons and daily assaults of the Israeli Defense Forces on the Palestinians who are without an army. May people be aware of the truth of this situation and come to terms with it. Why are these Palestinians acting this way? Palestinians in the West Bank and Gaza are under an Apartheid system. In Gaza, Palestinians are widely viewed by prominent political thinkers (Rev. Tutu, Chomsky) as living in the largest open air prison in the world. Gaza is under seige by the Israeli government. A seige is something you might remember from the fourteenth century where you keep your target people from movement and trade. In this case the Palestinian people are kept from movement and trade by land sea and air. This is what the Israelis are doing supported by Billions of US Tax dollars. The West Bank, an area widely considered to belong to the Palestinians (if not the entire region), is where more Israeli settlements are being built (and also as in Jerusalem, where Palestinians are taken from their homes and the home is either bulldozed or reposessed for an Israeli family), further denying lands to the Palestinians. Rachel Corrie, a Canadian, was killed in the West Bank, by a bulldozer bulldozing a Palestinian home, to make way for an Israeli home. In terms of water, the average Israeli in the West Bank home is accorded 1500 cubic meters, Israelis in other areas 300 cubic meters per person, and Palestinians are allowed 30-80 cubic meter per person. UN recommendations are a minimum of 100 cubic meters per person (per talk by Miko Peled). This water is from an aquifer that Israel annexed by the wall which also is considered to belong to the Palestinians. Are you starting to see what's happening here? There is no place for the Palestinian people to turn, they are a people without an army and there is no court to turn to because these are illegal or inhuman laws from a perspective of human rights that Israel considers legal. Again all with support from US tax dollars. This is why the last thing that Israel wants is the Palestinians to be seen in the UN as having the rights of a country where there would be the possibility of charges being brought before the World Court, the only court that might hear the Palestinians, if the world's people can't hear their cries. 11.20.12 BREAKING NEWS: 5 Israelis, 140 Gazans Dead-- an intense bombardment by Israel on Gaza, with over 1450 air strikes at this time on the Palestinians (CNN, JPost). The Palestinian people are being leafleted to flee their homes as if the Israelis will undertake a further bombing or land invasion of this tiny land. We are agrieved by the situation in Palestine\Israel and Gaza. Calling a spade a spade, Turkish President Prime Minister Erdogan says Israel's actions cannot be described as self-defense, but terrorism and an "attempt at Ethnic Cleansing". Our US tax dollars which support regular massacres of the people of Gaza is unconscionable and must come to an end. Our support must be questioned and aligned with higher values. Fighting and war are a desparate attempt to communicate with others. While there are some rockets, mostly hand made by pipes and fertilizer from Hamas resulting in rare hits (Jerusalem Post reports 140 handmade rockets) since they do not have sophisticated electronics, in comparison, the damage to the Gazan region, a virtual open air prison where people are trapped by Israel, will be in the Billions such as the damage 4 years ago. Apparently, these hand-built miniture rockets have killed very few Israelis. There is very little such damage historically to Israel in comparison to the damage to the Palestinians. The Palestinians are an unarmed people, that is, without an army. They do not have means of self-defense except these desparate attempts at self-protection. There is no court in which their rights are protected because their rights are limited in an Apartheid condition in which they have almost no rights, not even to their own homes which can be taken away and bulldozed. We are hopeful that Secretary of State Hilary Clinton and President Barack Obama can stem the never-ending flow of Israeli violence which begins with the Apartheid and the continued expansion of settlements into areas such as the West Bank, long considered internationally to belong to the Palestinians. We point to this because of the incredible fire-power in use by Israel, as if a tank with M16s are facing a mere child. All this is just before the election in Israel. So, when Israel asks for 24 hours of calm before committing to an agreement, they are only agreeing to stop the war they've created, not all of the checkpoints, the curfews, the theft of water and resources and land that is going on during that period as well. The Palestinians are being terrorized daily by the Israeli government. We are incredulous that we put up with the usage of our military funds to support an Apartheid in Palestine/Israel and massacre on these people trapped on a decreasing portion of their own land. It is with great grief we watch Israel take the water, the land, remove Palestinian people from their homes and bull-doze them, so they can continue their expansion. When will the US stop funding these kinds of atrocities? The other thing we learned is that there are US charities along with our US tax dollars that are funding Israel. That's a frightening kind of charity to think of. We know in our hearts how hard it would be-- if we too were trapped in the largest open air prison in the world, if our farmers and our fisherman were being beaten, we as Americans might be hard pressed not to want to hand build rockets when there are people who allow us only a toxic trickle of water, after all we overthrew a king over the indignity of high taxes. We as a nation would not put up being in a huge open air prison like those in Gaza, we would not allow a foreign nation to control most of our water and we would not accept the theft of natural gas in our nation's waters. We would not accept our farmers' lands being taken or our farmers being beaten. We would not accept the destruction of and theft of fishing boats or the hosing down of fisherman with highpowered fire hoses. We would not accept our most sacred trees being uprooted and taken for a bank or government building of another occupying force. We would not accept curfews where we could be shot, thousands imprisoned and nearly 20,000 homes destroyed. These actions which are discounted when we look at whose doing what to whom, most countries would consider are indeed acts of war. The fact is none of us Americans would put up with the way Israelis treat Palestinians at checkpoints for hours. This --- is an Apartheid worse than South Africa. We as a nation and world need to know what the truth of where are tax dollars go in Israel and what we are supporting. The only way to do this is to get news from outside of most media outlets.You would think that what is actually happening to Palestinians was happening to the Israelis by the way the media tells it. Just as we have seen the harm that the Iraq and Afghan war has caused harm to us as citizens-- to our soldiers, to our consciences, if not just economically to our people in the United States with increased joblessness, Israel's war on Gaza will only bring harm to itself and possibly to those who support Israel. We are not immune. We are, and people around the world are, already suffering at the hand of and thought of what is being done to the Palestinians with hard earned US tax dollars. How can we support this, when we need schools and teachers in our own country? While it may seem like an odd transition to quote from sacred texts, when we listen to Biblical teaching from Leviticus, a text which is shared by Jews and Christians alike, verse 19:18 states "Love your neighbor as yourself". In Buddhism, it is said that "Hatred never ceases by hatred, but by love alone is healed". And the Quran exhorts it's followers to help the poor. May we grow in our wish to liberate both sides in this conflict over land and resources as both sides are suffering. Post Script: Some of us suspect that this is the real reason that Petraeus was "removed" from office which also suggests that it is not strategic to unquestioningly support Israel without any standards for their behavior: In 2010, Petraeus said, "The enduring hostilities between Israel and some of its neighbors present distinct challenges to our ability to advance our interests in the AOR [Area of Responsibility]. Israeli-Palestinian tensions often flare into violence and large-scale armed confrontations. The conflict foments anti-American sentiment, due to a perception of U.S. favoritism for Israel. Arab anger over the Palestinian question limits the strength and depth of U.S. partnerships with governments and peoples in the AOR and weakens the legitimacy of moderate regimes in the Arab world. Meanwhile, al-Qaeda and other militant groups exploit that anger to mobilize support. The conflict also gives Iran influence in the Arab world through its clients, Lebanese Hizballah and Hamas." Israeli born Miko Peled's talk locally, reaffirmed all of our discoveries presented here that everything, every item we discovered which we summarize here is in parallel with including the shocking disparity of water to the Palestinians and innumerable injustices. In 1997, Miko's niece was killed by a suicide bombing. Miko's sister Nurit Peled-Elhanan said, "No mother should experience what I am experiencing. No mother, Palestinian or Jewish. And what have we done to Palestinians to so blight the hopes of their children that two young men would be willing to kill themselves and in so doing kill my daughter? The brutal occupation has done this. The enemy is not the Palestinians. It is the extremists in our own political life". Miko Peled is author of The General's Son: Journey of an Israeli in Palestine published by Just World Books. Miko describes the people of Palestine as a people undefended, without an army or military. Miko reveals in his book one more discovery that is shocking that is not covered here is that it was not Israel that was attacked in 1967 for example by Egypt, but Israel attacked Egypt from Peled's examination of the minutes of the army archives of meetings. This is a one page website designed to provide you with a solid overview of many issues of Israel/Palestine which we researched for months. It took months to wrap our heads around this. If you are following the US news we can state emphatically you are likely to know extremely little like we did, however, that may not be your situation. If you can read 1-9, you will get a quick overview of the issues (3-10 min). Israel/Palestine: The Untold Story, A concise 14 min, 2009, A Must See Video This film involved seven months of research. Some of us knew just the names "Gaza" and the "West Bank" when we started. This is part of the story condensed from months of work in one place that is not available through the American mainstream media but will bring you up to speed in minutes. The facts in this film were checked by multiple sources. What is missing is more about curfews, night raids and torture of the Palestinians. This situation is in fact much worse than South Africa, according to the Honorable Reverend Desmond Tutu in the section World Figures Speak Out, History, Myths. 2) Look at the Map of Palestine/Israel. The map tells you about the land once considered Palestine which is now held by Israel. The amount of land held by Israel is over 90%, but Israelis frequently state they are being pushed off the land. But what is in fact true? If anything is true by facts, it is the other way around: there is maybe 3-10% of the land held by Palestinians, this in a land that was once mainly inhabited by them. 3) It took months to wrap our heads around this and what we finally understood is... what you think is happening to Israel and Israelis is actually a much smaller quantity (10% or less, a rough estimate) of the immense amount of dammage that is happening to Palestine and the Palestinians in the Billions of dollars, loss of land taken by Israel, destruction of Palestinian homes bulldozed by Israel on top of which they build homes for Israeli settlers, number of deaths and injuries. And yet you hear about it in the mainstream news as if it were the other way around. That is, as if Israelis had all this mistreatment and incredible amounts of dammage and not the Palestinians. But it could not be more the other way around by an enormous margin. This was astounding to us as a group. Please check the facts. 4) Disappointing to American values, it is our US tax dollars at work 4-5 Billion per year and Billions in loans supporting this overwhelming oppression of the people of Palestine. This is the most funding per year offered to any country and to a prosperous countrty like Israel. The Israeli military regularly conduct nightly raids on homes, ruin fishing boats, kill and imprison Palestinian youth as well as adults. There is almost no recourse, accountability or justice for these crimes against the Palestinian people. The Israeli settlers themselves beat up farmers (see Ranked Videos). The Israelis test American made weapons like the DIME bomb which creates injuries so difficult to treat and White Phosphorous on the Palestinians which violates international treaties. Israeli Defense Forces Captain Shapira who has refused to continue destroying the Palestinian people, describes the incredible fire power used on the Palestinians and his own ethical dilemma. See Ranked Videos for viewing these realities, some of which contain children killed from US weapons and are therefore not recommended for young people. 5) Israel has total control over the people, their incoming and outgoing goods of Gaza in the manner of a seige which if you don't remember from fourteenth century history is a blockade. In this case the blockade is of land, sea and air making it the largest open air prison in the world. Israel is in control of the water, natural resources and off shore gas which rightfully belongs to the Palestinian people. There are few people around the world who would stand for such treatment, including their treatment through checkpoints in the West Bank. "We as a nation [USA] would not put up being in a huge open air prison like those in Gaza, we would not allow a foreign nation to control most of our water and we would not accept the theft of natural gas in our nation's waters. We would not accept our farmers' lands being taken or our farmers being beaten. We would not accept the destruction of and theft of fishing boats or the hosing down of fisherman with highpowered fire hoses. We would not accept our most sacred trees being uprooted and taken for a bank or govt building of another occupying force. We would not accept curfews where we could be shot, thousands imprisoned and nearly 20,000 homes destroyed. These, most countries consider are indeed acts of war. The fact is none of us Americans would put up with the way Israelis treat Palestinians at checkpoints for hours. This is Apartheid worse than South Africa". Quoted from a comment on the Huffington Post regarding Rev Desmond Tutu's support of UC students voting on a boycott of US corporations participating in war crimes in Israel. 6) Jewish people frequently make the connection between how the people of Israel are treating Palestinians and how their people were treated in the Holocaust and they report being shocked, angry and ashamed that Israel would do such a thing. One of our dear elder Jewish members who fled Europe could not bear the pain of watching our Ranked Videos. You can see her talk about her awakening in Ilse, once a Zionist, Has a Change of Heart About Israel below in Americans Speak Out About the Middle East. Ilse who is of course Jewish, wants American and International Jews to move on from the Holocaust, to stop using it as an excuse for maltreatment of others and deal with the truth of what is happening now. 7) The UN has the most sanctions and attempted resolutions against Israel--more than any other country in the world and the US consistently blocks statements which make Israel accountable. Israel seems to have violated more UN resolutions than any other country. In addition there are many calls by the world as well as the UN Security Council which has demanded that Israel end the blockade of Gaza. 8) Then there is AIPAC, the Israeli lobby acting in the US considered to be the most powerful in the world which has an enormous influence in Congress and the Pentagon. Please see the European Fim, AIPAC, The Israel Lobby in Films. 9) And last, let's address how the American media is complicit in this reporting. A brief example is that the New York Times (NYT) cover will have a picture of a handful Palestinians with guns in the West Bank, but never the picture of the endless night RAIDS, of the Billions in dammage after the invasion of Gaza and certainly not the tanks rolling into Gaza with unimaginable firepower (see Barbara Lubin, who works tirelessly for the welfare of children in Palestine, discuss the war on Gaza in Film: What I Saw in Gaza in the section Americans Speak Out About the Middle East ), or the facts on the loss of Palestinian lives and injuries or the theft of water by the wall, homes being bulldozed regularly or the Billions in Gas reserves off the cost of Gaza that Israel is guarding and plans to take from the Palestinians. It is the first time we recognized that a photograph really could deceive by giving a false picture-- when you are missing 97% of the facts as we too were missing these facts. This is about being against oppression and an occupying force as Israel is in the region. We Americans, too, protested the British control of our colonies. We seem to forget that so easily as we invade and occupy other countries. If you want to know who profits, American companies supporting the occupation, press here. We as Americans need to see and know what is there, stop funding these attrocities that are preventing the very peace we say we want. This is about bringing the money home for our schools and for our infrastructure. We will never "win" anything through this kind of action which is based on hate. In our hearts, we know this is true. Please read our Mission if you have time to understand how our support of Israel is an enormous source of distrust in the Middle East. May this work be of benefit toward a greater understanding of all peoples and what is presently going on in the region. May you help the world find peace. 0. We want to make information available which we have explored so that the American public can make informed decisions about US policy regarding Israel/Palestine. We think it is imperative that the Global Community know this information. We need to know what our tax dollars are doing and how they are contributing to suffering in the world if we are to do something about it. 1. Mistrust in the Muslim world toward the US is linked to Israel's treatment of Palestinians and is a cause of terrorism. The tension in Israel/Palestine is creating animosity throughout the world and potentially threatens all of us. 2. The unresolved conflict in Israel/Palestine is draining billions of precious tax dollars from our treasury and leading to the isolation and decline of Israel, America's strongest Middle Eastern ally. 3. With the rise in terrorism and the number of countries possessing or developing nuclear weapons, we can't afford to waste any more time or money on a policy that supports instability in one of the most volatile regions of the world. 4. Our main goal is to change US policy toward Israel. We understand that this issue is very complex, emotional and politically charged. However, we see that the situation in Israel/Palestine is not sustainable and that it is indeed a dead end. We need a light at the end of the tunnel, a solution which is sustainable, peaceful and just. 5. We think that changing this relationship with Israel and the way we support Israel will help Israel normalize its relations with its neighbors, since it is the unqualified support by the US that allows much of this to occur. This change will provide a greater basis for peace in the region and around the world. Find out what you think. Do something today for peace. The time is now. Make a difference. Tell Your Friends by email, Facebook, or Myspace, write to Congress, start a project. This is a concise 14 min, A must-see video overview of what the US media is not telling you. Unforgettable account of parts of daily life for the Palestinians with the Israeli occupation and apartheid. Ethan, the grandson of a Holocaust survivor, describes in detail, including from his own experience, what is going on in Israel/Palestine. Date: October 3, 2009. Authors of Palestine in Pieces: Graphic Perspectives on the Israeli Occupation. 11:45 Analysis by former CIA agents: Policy is not in the interest of the US and is a root cause of terrorism, enabling a gross injustice to the Palestinian people. Former agent describes his own conversion and root causes of problems with Muslim world. Power of the Israeli lobby is out of proportion in USA. 600 Checkpoints in the West Bank. Middle-of-night raids on Palestinians, night after night. Please call or write to Obama, Congress. A sample letter provides a place to start. See your US Tax dollars at work in the is film of the aftermath of operation Cast Lead on the people of Gaza in 2009. Also known as the Gaza Massacre with as much as an estimate of 2 Billion in property damage, not including loss of lives, injuries to people and their livelihoods. For a complete report at jstor.org http://tinyurl.com/bvycrvk. For over 30 years, Barbara Lubin has worked tirelessly and fearlessly for the well-being of the Palestinian people, bringing them much-needed supplies, schools, and medical aid. She traveled to Gaza in July and after the Israeli attack in January, 2009. Please donate now to help with aid to Gaza. Please share widely. Permission to duplicate granted. If the form does not pass zip, please try writing a letter here. In Spring 2008, Hampshire College became the first US college to divest from the Israeli occupation�33 years after they became the first US college to divest from Apartheid South Africa. We are proud to announce the 2009 National Campus Boycott, Divestment,Sanctions Conference, taking place Nov20th - Nov 22nd at Hampshire College in Amherst, Massachusetts. Find out more and register. Join the growing international boycott movement: Act on your conscience with your money. One of the most potent tools we have available to us as conscious, concerned people, stems from our ability as consumers to choose not to buy products of a corporation that is profiting from behavior which is questionable from a moral and legal standpoint. Justpeacemideast has researched other sites focussing on the boycott effort and identified corporations who we believe are profiting from the Israeli occupation and imprisonment of the Palestinian people. These companies do business in Israel. Some of them such as Estee Lauder, which market beauty products and Sara Lee, the food product manufacturer, have CEOs who are very active in their support of the Israeli occupation. This list is not exhaustive: we have identified the best known brand names. We ask that instead of giving your business to these corporations, instead try looking for an alternative brand. By making an informed choice and exercising consumer power you can make a difference. In the wake of the recent death toll in Gaza (January 2009 invasion), when over 1,300 Palestinians were killed, Israeli economists have started to report the growing impact of the international boycott and divestment campaign on the Israeli economy. Just as with apartheid S.Africa in the 1980s this movement can make a crucial difference over time by targeting the most vulnerable part of the state which is its economy. Money talks in a way nothing else can. By making the occupation of Palestine economically prohibitive, Israel will be forced to negotiate an end to its unsustainable policies. The growing international boycott and divestment campaign is attracting support from both non-Jews and Jews as the recent vote by Independent Jewish Voices of Canada to support the campaign demonstrates. We would encourage you not only to boycott these companies but to contact their representatives and tell them why you are refusing to buy their products. This way they become fully aware of how their actions are affecting their profits. These are well known companies that do business with Israel and thus indirectly finance the occupation. If you own stock in any of these companies you have the right to attend shareholder meetings to register your protest and vote to withdraw company investment in the Israeli economy. Another option is to organize and pressure institutions such as colleges or city councils to divest their holdings in companies that support Israel's occupation. At present the only national party to embrace divestment from Israel is the Green Party. The only college in the US to commit to divestment is Hampshire College although the college has claimed that this policy was aimed at companies that violated its policies on socially responsible investments. There have been a number of, so far, unsuccessful attempts to persuade city councils to divest. Raytheon United Tech Corp. Citygroup Inc. If you want to be part of the international movement for nonviolent action in support of political change in the Middle East: this is your opportunity. Take a Stand for Peace and Justice.